Region: This Caterpillar is found throughout the eastern United States, but the northeastern United States is hardest hit. Life cycle: This Moth produces one generation each year and overwinters as an egg and hatch in spring. The pupal phase lasts two weeks. Of the moths that hatch, the females cannot fly, while the males are strong fliers and home in on pheromone, exuded by their prospective mates. The male die after mating. Physical Description: The 2-inch long, nocturnal caterpillar is a hairy gray or brown worm, bearing five pairs of blue and six pairs of red spots. The adult male moth is gray, while the female is white, and both have hairy bodies with a 1 1/2 to 2 inch wingspan. The light brown to yellow eggs are laid in large groups of 400 and are covered with hair. Feeding characteristics: This pest attacks apple, birch, basswood, cherry, linden and willow plants. 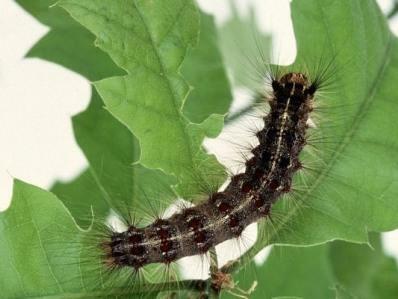 Large groups of caterpillars feed on foliage at night, hiding in orchard or garden debris during the day. In a worst case, this larvae can strip a forest of their foliage. Deciduous trees can make a come back, but are weakened after several years of damage. Evergreen trees cannot grow a second set of leaves, therefore, perform significantly worse. Calosoma sycophanta, Spiders. Ants are occasional predators. A commercially availableBraconid parasite is very effective. Many birds are also helpful, such as, Grackles, Crows, Blackbirds, and Redwings Blackbirds, Cowbirds, Chipping Sparrows, Nuthatches, Downy Woodpeckers and Cuckoos. Bacillus thuringiensis and nuclear polyhedrosis virus are two nonchemical sprays that can be used very successfully. Other controls can also be effective. From August to April, scrape them into a bucket of soapy water. Once the caterpillars are out, handpick as many as you can. Once the caterpillars are mature and hiding during the day, you can trap them by putting a one-foot wide strip of burlap around the trunk by draping it over a string. Many caterpillars will hide under the burlap, and can be easily collected in the morning. Drown in water and dispose in compost pile.